Pinchbeck Under 16s are pictured in new kit sponsored by the Field House Residential Home in Eye ahead of their Lincolnshire County Cup game against Marshalls. The match was abandoned due to bad weather with the score at 2-2. From the left are, back, Martin Johnson (coach), Chris Ward (assistant coach), Jordan Johnson, Sam Ridgway, Ben Smith, Joe Briggs, George Craig, Lee Addison, Stefan Stoleru, Dave Smith (assistant coach), Paul Dempsey (Field House representative), front, Ben Mansfield, Tom Thorold, Luca Ward, Michael McGowan, Joe Bull and David Borowski. It’s looking good on two fronts for Feeder Soccer in the Peterborough Junior Alliance League. The city club are setting the early pace at both Under 12 and Under 13 level and top the Division One table in both age groups. The Under 12s followed up their opening day win over Hampton Royal with a 1-0 success against Stanground Sports on Sunday. Feeder Under 13s have made a flying start to their season, striking nine goals in both their games so far. Their 9-0 win over Riverside on Sunday came courtesy of goals by Matthew Mills (4), Macy Jackson, Miles Morris, Louis Peters, Riley Taylor and Jude Watson. Reigning champions Yaxley made a promising start, smashing Boston United 11-0. Leading the way in Under 14 Division One are top-flight newcomers Leverington Sports, who have amassed an impressive 22 goals in their first two matches. Riverside Rovers were on the receiving end of a 12-0 thrashing on Sunday and the deadly dozen came from Jack Greenacre (5), Daniel Roberts (2), Harry Robinson (2), Reily Tegerdine, Oliver Yorke and Freddie May. Netherton and Whittlesey Blue also have 100 per cent records in this division. Netherton were 5-2 winners against Crowland on Sunday while Whittlesey Blue cruised to a 4-0 victory against Hempsted United through goals by Joe Scott (2), Tinashe Mutizwa and Luca Di Canio. Under 14 Division Two table-toppers March Soccer School are another side with an eye for goal. They won 8-3 at Bourne Town with goals by Daniel Cave (4), Jack Hayes, Jenson Carpenter, Jack Dawson and Riley Collier-Holland and that came hot on the heels of a 9-3 win over Netherton Hawks. Hawks bounced back from that defeat to win 6-2 against Glinton and Northborough Amber. Ruben Simoes led the way with a hat-trick. The best individual goalscoring feat on Sunday came from Ollie Foley. He smashed a super six goals for Whittlesey Blue Under 12s in a 10-0 Division Two triumph against Bourne Town Red. Four players - Caiden Ainley, Luke Broadway, Josh Grant and Luke Woodhouse - scored hat-tricks for Glinton and Northborough Amber Under 12s in a 13-1 win at Wisbech St Mary in Division Three. Peterborough Sports were runaway winners of the Under 15 Division One title last season and it’s looking good for a repeat performance. 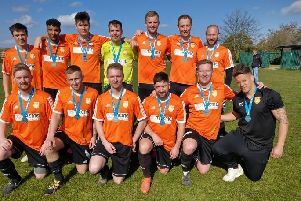 It’s early days, but Sports made a spectacular start to their league campaign on Sunday when scoring a perfect 10 without reply against Yaxley. Lemar Moore bagged a hat-trick with James Cooper, Marcus Goymour and Josh Hogg all firing doubles. Substitute Jamal Shenille made it 10. Another substitute to find the back of the net in this division was Charlie Orbell and he did it three times for Werrington Athletic in an 8-0 win over Deeping Blue. It wasn’t such a good day for Peterborough Sports in Under 16 Division One. They came off second best in the ‘clash of the giants’ against Gunthorpe Harriers Navy. Gunthorpe took the honours 4-1 with hot-shot Andrew Irvine netting all four goals. Last season he finished with 49 goals in all competitions. In Under 16 Division Three, Evan Walters hit four for Hampton in a thrilling 7-6 win against Stanground and Charley Corleys did likewise for Phoenix in a 9-1 win against March Rangers. Peterborough Sports Under 15s need a couple more players. Anyone interested should contact Martin Rowell on 07590 328064.